For a no obligation budgetary price please complete this short form. OEE – Overall Equipment Effectiveness - is now universally recognized as an effective method of measurement, control and improvement of manufacturing efficiency. 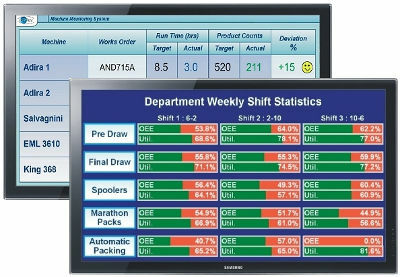 Eliminates the problems associated with manually collecting OEE information. PlantRun automated OEE monitoring has been proven in use in a wide range of manufacturing sectors. Our current users report a typical payback period of under 12 months. PlantRun costs just a fraction of new capital equipment so it makes sound financial sense to implement an OEE system to free up “hidden” capacity first.